My manuscript is now 150 pages. How long is the average book? Is it long enough? A: That depends. Is your story done? The Battle of the Sexes … Really? As I waited at McCarran International Airport in Las Vegas to board a flight to Los Angeles, my eyes caught sight of a nearby newsstand. I’m always interested in what the latest publications are, what’s hot in the literary world. But it wasn’t the articles or magazines themselves that intrigued me. I was struck by the ORGANIZATION of the magazines themselves. 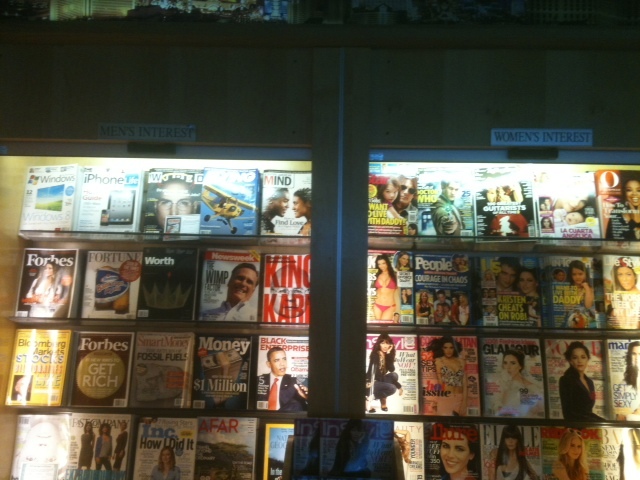 Hopefully, you can see (sorry, smart phone photo app does not make me a professional photographer) Forbes and Money and Newsweek on the left side – and Oprah, People, Cosmo, and Vogue on the right. Okay, I get that. Business, serious stuff together – gossip, fun, “light” stuff also together. … my review of Wild, by Cheryl Strayed, in the Las Vegas Review-Journal. Cheryl Strayed’s memoir of her solitary journey along 1,100 miles of the Pacific Crest Trail is not just a journal of a long-distance hike. Yes, it is a tale of surviving the elements, facing danger — from man, beast and nature — fighting fatigue, hunger, thirst and blisters, but that is almost secondary to the battles waging from within as she tries to understand the death of her mother, the dissolution of her marriage, the destruction of her family. 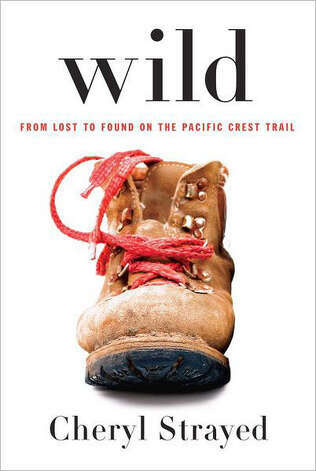 Still, Strayed’s storytelling in Wild: From Lost to Found on the Pacific Crest Trail does not resort to maudlin musings or sappy sentiments to hook her readers; she is honest in admitting her own shortcomings and less-than-stellar behavior. While she is angry and hurt, she does not blame others for her own failures. She does not pick and choose what to remember or share with us; instead, she airs all her dirty laundry (which, after miles and days without a shower, is literally quite a lot) and asks only that we accept her choices, whether we respect them or not. Wild certainly found its way into my head. Jami Carpenter is a freelance editor for Stephens Press, Trapdoor books, and independent writers, host and executive producer of Vegas PBS Book Club talk show and co-author of Education in the Neon Shadow.